Across the North-East, the Centre is being questioned for attempting to blur the lines that differentiate communal and community consciousness. 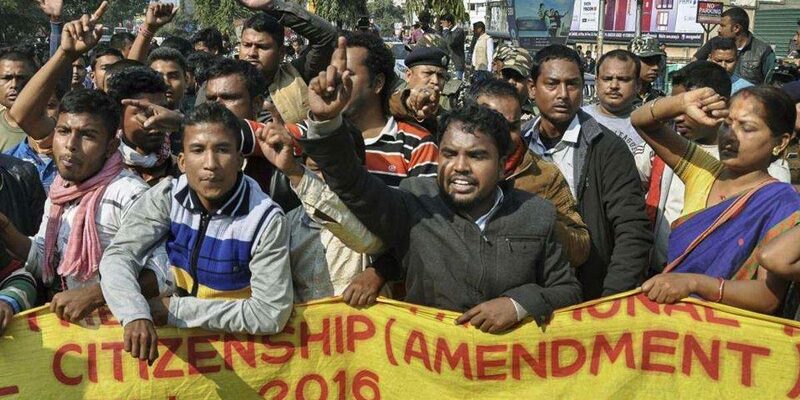 New Delhi: For nearly a week now, there have been massive public protests across Assam against the Centre’s decision to push for the Citizenship (Amendment) Bill, 2016 in parliament. The Bill extends – on religious lines – the cut-off date for “illegal immigrants” in the state to acquire Indian citizenship from March 24, 1971 to December 30, 2014. It was passed in the Lok Sabha in the recent session and is awaiting the Rajya Sabha’s nod. The 1971 date, exclusive to Assam, was appended to the Citizenship Act, 1955, under Clause 6A. This was agreed to in the Assam Accord, which put a lid on the six-year-long anti-foreigner agitation in 1985. Though the Supreme Court is yet to decide the very validity of Clause 6A, the bill amends its key provision. Also Read: Citizenship Bill: Legislative Chaos or Amnesia? By extending the cutoff date to 2014, the Modi government is segregating undocumented immigrants from neighbouring Bangladesh into Hindus and Muslims. If the Bill becomes law, Hindus from that country living without the correct documentation not just in Assam but in the rest of the country too would be given preferential treatment by bringing in a new citizenship cut-off date – December 31, 2014. This date would go against the Assam Accord, which doesn’t differentiate between undocumented immigrants living in Assam on the basis of religion. This has been the trigger for the protests. Besides Bangladesh, the Bill also aims to give Indian citizenship to non-Muslims from Pakistan and Afghanistan if they are victims of ‘religious persecution’. Although the Centre’s move also seeks to grant citizenship to ‘persecuted’ Christians from these three Muslim-majority countries, the Christian-majority states in the Northeast have also joined Assam in opposing the amendment as it would affect the indigenous composition of their societies. Due to the massive public outrage, almost all the BJP’s partners in the Northeast have threatened abandon the North East Democratic Alliance (NEDA). The BJP’s partner in Assam, the Asom Gana Parishad (AGP), has already walked out of the coalition government. 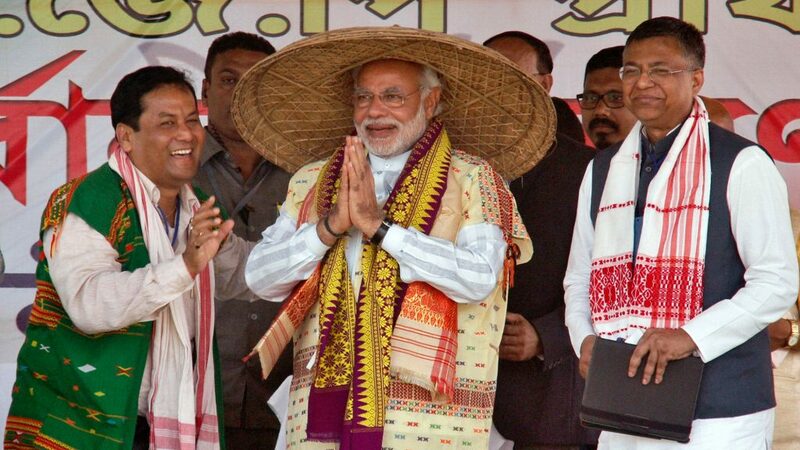 Though the Modi government tried to offer a consolation to the Assamese by setting up a “high-powered committee” to suggest ways to implement Clause 6 of the Assam Accord, it failed to get any traction. 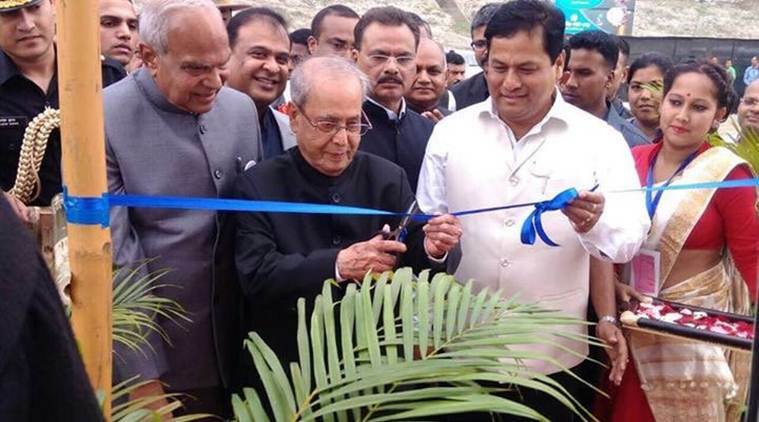 Almost all members, including former tourism secretary M.P. Bezbaruah, who was to head the committee, refused to be part of it. Clause 6 of the accord entails constitutional safeguards to “Assamese people”. Curiously, even though granting Indian citizenship on religious lines marks the BJP government’s first major stab at formally subverting the secular tenets of the constitution, the issue has not generated much controversy across ‘mainland’ India. It is only in the North-East that the Centre is being questioned for attempting to blur the lines that differentiate communal and community consciousness. The massive protests across Assam against the Bill, therefore, need highlighting. They underline – once again – that Assam’s is essentially an unresolved conflict over migration from East Bengal/Bangladesh. It is not the Hindu-Muslim clash that a wide section of mainstream media – and Hindu and Muslim communal elements – understand it to be. The original song, a popular number across communities in Assam, is a Zikir, a form of devotional music propagated in the state by Ajan Fakir, an Irani saint who preached Islam in the 17th century. Its message is: there may be different routes to reaching God but when you die, all merge with the same elements of earth. The high regard in which different communities hold Zikir underlines the state’s composite culture. This Zikir is also one of the umpteen numbers sung by Zubeen Garg, the best known contemporary singer in Assam. 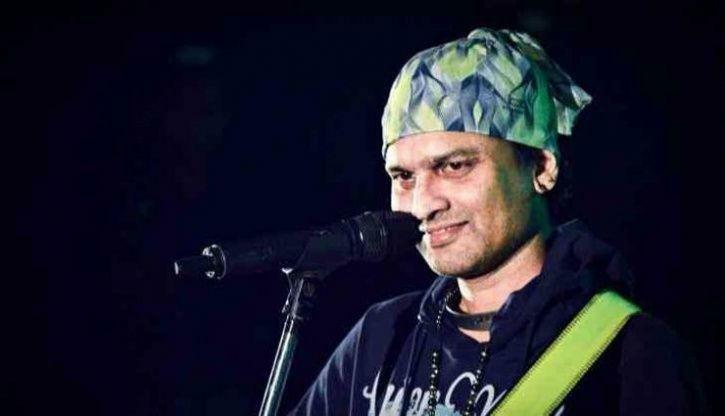 Zubeen also sang the BJP’s 2016 assembly election song – Xokolure Ananda Sarbananda (Everyone’s joy, Sarbananda – referring to the BJP’s chief ministerial candidate then). 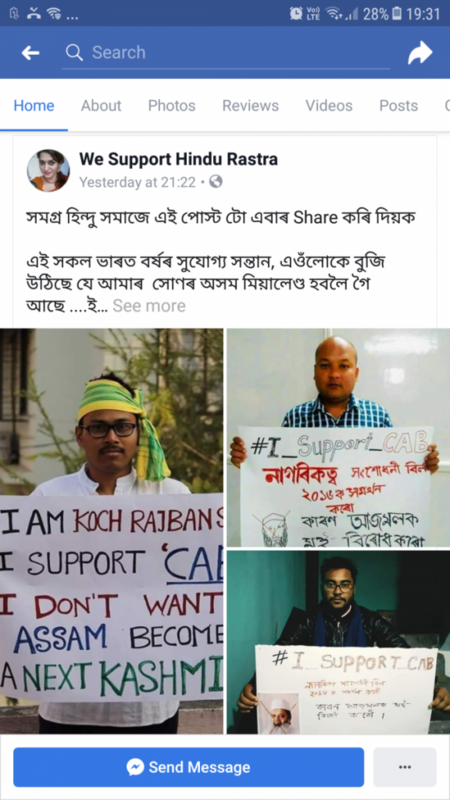 This stand against communalism by a popular public figure, who supported the BJP until recently, is largely representative of the Assamese community. What makes this reaction all the more consequential is that Assam is one of the states where the BJP in recent years has not only registered spectacular growth but so has its parent body, the Rashtriya Swayam Sevak Sangh. Aside from covertly trying to manoeuvre the anti-foreigner agitation, the first opportunity the right wing forces saw to amplify their mission in Assam was the Illegal Immigration (Determination) Act brought by Indira Gandhi in 1983. It was seen by the majority Assamese community as an attempt by the Congress to primarily protect its vote bank comprising Muslims of East Bengal origin. The Congress’s failure at the Centre to implement the terms of the 1985 Assam Accord – to detect unauthorised immigrants on the basis of an agreed cut-off date and seal the open border with Bangladesh – provided an inroad for the BJP/RSS to creep into the wider Assamese society. The increased influence of Wahabism in Assam, particularly among the Muslims of East Bengal descent, also made it fairly easy for the Hindu right-wing elements to set up shop in the Brahmaputra valley. In the Assamese heartland, the Hindu right-wing played on the majority community’s perennial fear of becoming a minority due to a perceived rise in migrant population. Working to limit the definition of ‘foreigner’ or ‘Bangladeshi’ to only a Muslim of Bengali descent, these forces gave a religious twist to the anti-migration sentiment of the Assamese. That Muslim majority districts rose from six in 2001 census to 11 in 2011 gave the right wing wind. Looking at Assam’s public mood these days, the BJP-RSS seem to have overlooked the fact that their success was primarily a reaction of a section of Assamese to the non-fulfilment of the Accord’s terms; that it was largely an expression of anger against the Congress for backing ‘illegal immigrants’; that they were backing the BJP as just another national party which promised to protect their jati, mati, bheti (community, land and hearth). The right-wing forces saw the success of the BJP in the 2014 Lok Sabha and the 2016 assembly polls as confirmation that their ‘Mission Hindutva’ had reached its goal in Assam. For some year now, RSS ground workers have been trying to override Assam’s Vaishnava Eksarana Dharma and the ethos promoted by the revered 15th-16th socio-religious reformer Sankardeva with the very forces he fought – the caste-ridden Brahmanical elements promoted by the then Ahom rulers. An example was seen in March 2017, when Brahmin priests were flown in from Haridwar for the Namami Brahmaputra festival to worship the Brahmaputra along with some satradhikars (monks) from Vaishnava monasteries set up on the ideals of Sankardeva. Assamese civil society, alarmed by this attempt to foist a new culture of worshipping the Brahmaputra like the Ganga, severely criticised the festival. Luit, or the Brahmaputra, is dear to every Assamese and part of the community’s ethos and culture. But they do not worship the river in the Brahmanical tradition practiced in the mainland towns of Varanasi and Haridwar. That perennial rains descended on Assam on those days, disrupting the outdoor festivities sponsored by the government, was looked at by many as nature’s way of opposing the puja offered to their Luit. Yet, the BJP/RSS forces failed to gauge the people’s perspective that the festival was an imposition on their culture and ethos. Instead, they perceived it as a sign of their success in blurring the distinct lines between Sankardeva’s Dharma and the rabid Brahminical variety that the RSS promotes. It was based on this purported success of ‘Hindutva’ in Assam that the national BJP/RSS leaders in charge of the state and the party’s spin master Himanta Biswa Sarma, began polarising Assamese society on the Hindu-Muslim axis for the 2019 general elections. With the help of the Citizenship Amendment Bill, they hoped to present only the Muslims as ‘illegal immigrants’ and thereby try and form a new political axis between the majority Assamese community and the Bengali Hindus, widely seen to be supportive of the Bill. The Bengali Hindus have long been a vote bank of the BJP in the state. 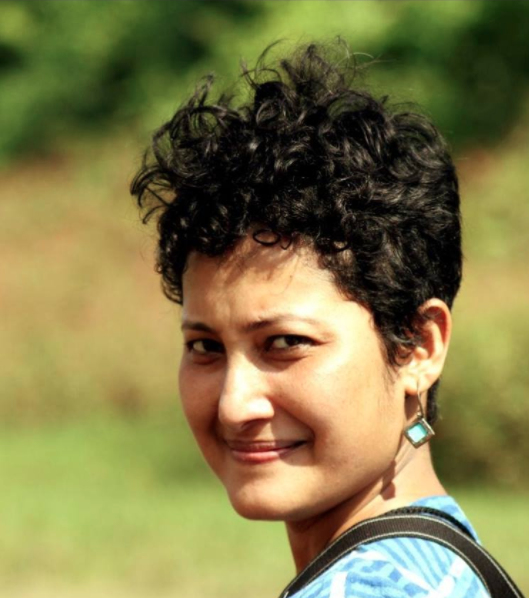 Sarma’s public statements on the Bill have been an attempt to highlight that ‘Hindu’ axis. He called it the ‘saviour’ of the Assamese people, urging them to accept Hindu Bangladeshis to save themselves from the ‘Jinnahs’ and to prevent Assam becoming ‘a Jammu and Kashmir’. However, such pleas seem to have failed so far. The government was forced to wake up to the difference between communal and community. The Centre had to scurry for a quick solution to offset the rising anger lest it would topple the BJP’s applecart, not just in Assam but the rest of the Northeast too. With the three Hindi heartland states slipping from out of its hand, every Lok Sabha seat is crucial to the BJP’s success in 2019. The Northeast has 25 of them. The result was the Centre’s sudden assent to grant Scheduled Tribe status to six Assamese sub- communities. The immediate aim was to divide the Assamese society to weaken the negative impact of the Bill and try to reap the benefits in the elections. These communities comprise the main crux of the Assamese voter base. Thereafter, BJP/RSS workers injected into social media platforms messages that the Bill is a ‘saviour’ for these communities from Badaruddin Ajmal, the chief of the All India United Democratic Front (AIUDF), which is backed by Muslim clerics. Youth flaunting gamusas and the traditional attire of these communities were made to hold posters that said they support the Bill because it would save them from Muslims. It was a reminder of similar divisive politics played between communities by the Congress-controlled Centre in Assam during and after the anti-foreigner movement. However, the Centre’s move gave rise to another conflict – the anger of the other ST communities, including the Bodos. These groups have been opposing the grant of ST status to the six communities in the fear that it would force them to share their limited opportunities with a wider population. On January 11, a state-wide bandh was called by various tribal organisations against the Centre’s move to expand the list of STs. Following pressure from another NEDA partner in Assam, the Bodo People’s Front, the Centre has formed a committee to look into the matter. Meanwhile, yet another trick towards polarising society was tried out in the Bengali dominated Barak Valley by the ruling party. On January 10, Silchar-based BJP leader Pradip Dutta Roy, in a video clip, threatened that the Assamese/indigenous students of Assam University would be thrown out of the Valley if they protest the Bill. The clip was widely circulated in social and other media. The aim was clear – revive the fault lines between the Assamese and the Bengali Hindus in Barak, so that the voter base of Silchar Lok Sabha seat remains intact with the BJP. Contrary to popular perception, many Bengali Hindus across Assam are upset with the BJP for politicising the community and making it vulnerable to Assamese chauvinistic forces. Bengali Hindus suffered at the hands of these forces during the anti-foreigner movement. Also Read: Hiren Gohain Has Been Charged With Sedition. Here Are His Actual Views. In November 2017, five Bengali Hindu labourers were killed in the Brahmaputra Valley by unidentified gunmen because their community was perceived to be supporting a Bill that would make ‘illegal Bangladeshis’ Indian citizens. Even Bengali Hindu students reportedly protested against the Bill in Assam University. Following a hullabaloo in the Brahmaputra Valley against Roy’s comment, the state BJP leadership had to suspend him from the party. With the 2019 polls drawing closer, the Centre might announce more electoral sops to polarise voters on religious and community lines in Assam. Whether it will douse the anger or fan it depends on the nature of the sops. But the fundamental question before every Assamese remains – do they want their culture, traditions and identity to be swamped by Hindutva or would they rather remain Assamese, carrying forward the verdant legacy of Sankardev and Ajan Fakir. Zubeen, through his public protest against the BJP’s move, has ticked the box to remain an Assamese.